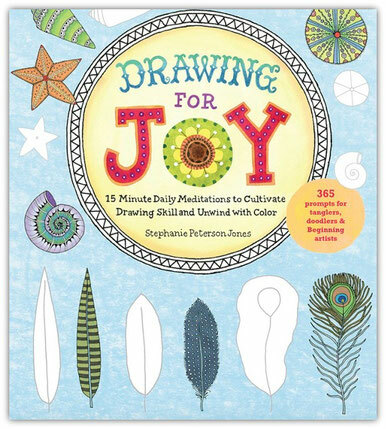 First of all, "Drawing for Joy" is a book intended for the beginning artist, who wants to develop a daily drawing practice, without stress or self criticism, and where they will come to experience the many benefits of mindfulness and meditation. There are 365 daily prompts along with simple art instructions along the way. Basic instructions on how to start a meditation practice are given in the introductory pages, and meditation resources are in the back. In the first weeks the reader practices lines, shapes and textures and by the end they are combining their new skills to form more complex drawings like mandalas and hot air balloons. So, how it came to be. I always liked to draw, and was fortunate enough to grow up in a neighborhood where, from a very early age, a group of kids sat around a low coffee table, completely absorbed in drawing together. After experiencing a couple of career shifts from children’s illustrator to Pilates teacher/studio owner to K-12 art teacher, I enrolled in a Master’s Program specifically for art teachers at The Graduate Institute in Bethany, CT.
For my final project I decided to embark on a daily practice of meditation (10 minutes) followed by process art making (15 minutes). My personal goal was to quiet my inner critic and monkey-mind and rekindle my joy of art making for it’s own sake. The academic goal was to find out how one affected the other. What I found was that meditation quieted my mind so that I became more present in my art making. I was able to make art from a process point of view and let go of the results. I became less fearful of the blank page. I felt relaxed and peaceful. I smiled more. And my work was authentic, truthful to who I am in every way. I started each day with joy and acceptance. I still do this practice, sometimes changing how I do it, whether it’s meditation and art or only art, sometimes for a very short time, sometimes longer. But my passion for and focus while I make art are constants, and art is once again my career and how I define myself. While teaching art, however briefly, I was saddened by how many middle school (and younger) kids were already intimidated by art and had the belief that they couldn’t do it, or weren’t creative, and they had no confidence in their abilities as artists. I wanted more than anything to change this, to show them that they could do it, slowly but surely, and have a great time while doing it. I wanted to spread the word and write a book about how to begin a daily drawing practice. I wanted it to be completely approachable, fun, and stress-free. I wanted to share how meditation helps keep you present and let go of outside stress. I wanted others to experience what I did while doing my Master’s project, and to enjoy simple art making as a practice. When the new year 2016 arrived I had a very loose draft of a proposal on my desk. It was not ready for presentation but it had been sitting around for awhile. I realized that if I didn’t get it out now, I may miss my opportunity, so I sent it, in a pretty rough form. I connected with a publisher who I met through a former neighbor. She liked my idea and with a little tweeking, they decided to go with it. I spent May through September creating the book, working with a wonderful editor at Quarto. We made sure the progression flowed and that the instructions made sense. Because this book is very basic it is appropriate for many audiences. It is great as a therapeutic practice for people suffering anxiety. It would be a good resource for the guidance department in schools, both middle and high school. It is good for people who long for a creative outlet. It is good for everyone, actually. I have continued to keep up with my daily art making. What that consists of is having 4 x 6 pieces of watercolor paper handy and just starting to paint. I mostly don’t use pencil lines to organize, and prefer to just freely paint. I like to use black ink and white gel pen to enhance and add details. Most of this imagery is abstract or very general shapes. Stephanie Peterson Jones is a children’s book and product illustrator who lives with her husband Paul in Asheville, NC. 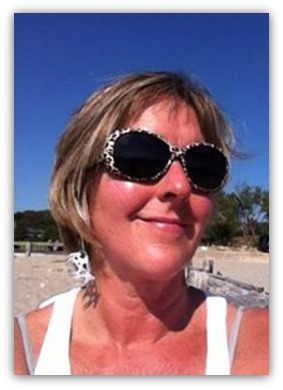 Art making is her passion, but she also loves doing and teaching Pilates, hiking, swimming, knitting, and her new pup, RIO. Always a seeker of meaning, "Drawing for Joy" is the culmination of many of her life’s experiences and she is beyond thrilled it came to be. If you’d like to contact Stephanie, her email is peetyjones@icloud.com. 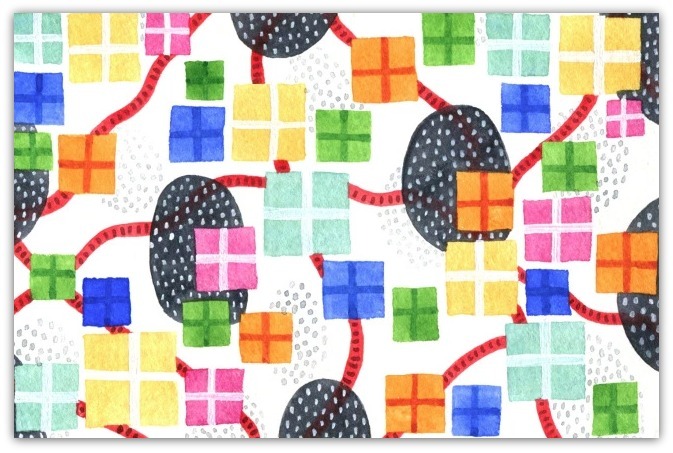 You can purchase Drawing for Joy through the resources listed here and can keep up with her creative work on Facebook, Instagram, or her website.